Hi everyone, I came across this issue while recording some videos to go along with the articles I have written/posted (NOTE: MiCloud now has its own YouTube channel!). So, in System Center Orchestrator, after you have downloaded, installed, registered, and deployed Integration Packs, you need to setup/configure the connection between Orchestrator and the product. In this case, I was demonstrating with the System Center Operations Manager Integration Pack. 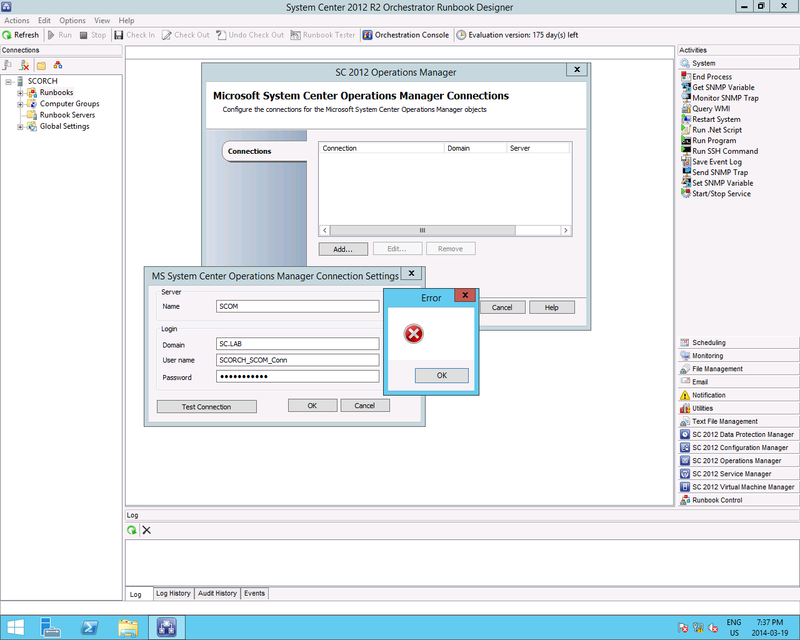 When I attempted to configure the connection to the SCOM server, and tested the connection, Orchestrator threw an error. No big deal right? Wrong! The error was blank/empty! Even checking the Event Logs didn’t provide any help. So what is the solution? Well, I never did find any log files or event logs, etc. that could help point me in the right direction. However, I remembered that when using Orchestrator (and integrating with other systems) you need the application’s console installed. So in this case, since I was working with the SCOM Integration Pack, I had to install the SCOM Console (and connect that console to the SCOM Management Server). I won’t walk through how to install the SCOM console (you can see how through my SCOM Installation Guide). After I completed the SCOM console installation and connected it to the Management Server, I went back into the Orchestrator Runbook Designer and attempted to create the connection. This time I was able to successfully test the connection.